When I saw the Bloodstoker for the first time I was puzzled. How was this chubby fellow supposed to fit between the ranks of an army where even the so-called-priests look like Dwayne Johnson's cousins? 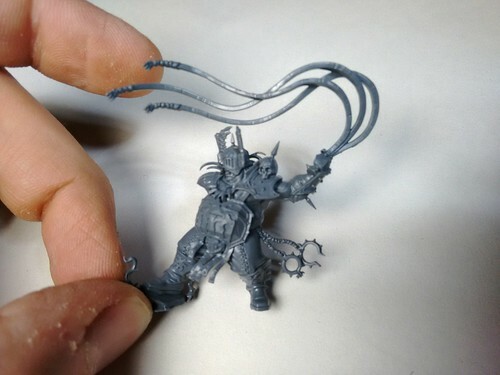 Don't get me wrong, the miniature itself is quite good, with very interesting bits, but in my opinion it looks like something popped out from a more "nurglish" box. Above all a poor amputee! Where's Khorne Labor Union? So, even if I planned to paint the army out of the box (somehow I can hear my fellows laughing in the distance), it's clearly conversion time! 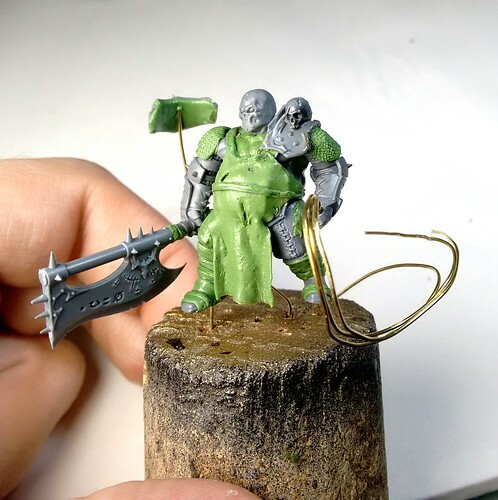 I've never modified an "organic" subject, so remembering what happened with the Reaevers, I chose a simpler "bashing" approach, instead of scratchbuilding most of the miniature. Since I had a couple of boxes rich in option parts, I took the most problematic pieces to sculpt (the arms and the head) leaving just the junctions and some simple clothes to my putty abilities. 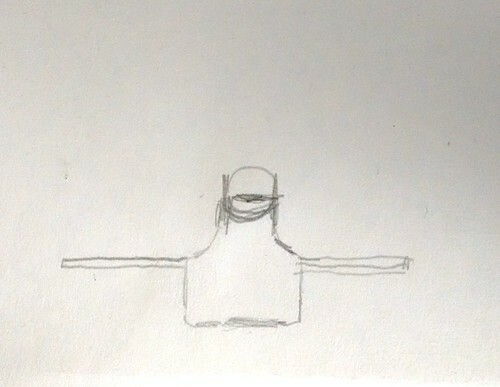 I carved deeply between the shoulders to better adjust the general posture. Resculpting the pectorals and the trapezium was not a big deal, since our little fellow is quite chubby and, therefore, I just needed the main anatomical volumes. 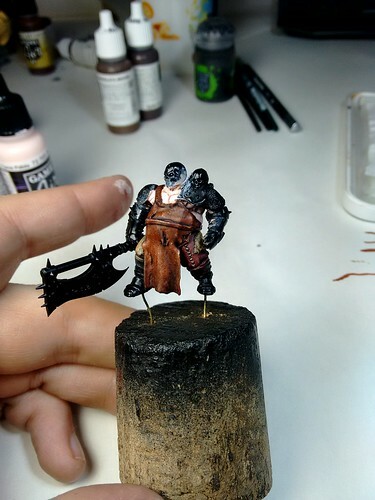 To better hide the strange legs position given by the former pose, I initially thought about some sort of loincloth, but to add a bit of charisma to the Bloodstoker, I opted for a worn leather apron. 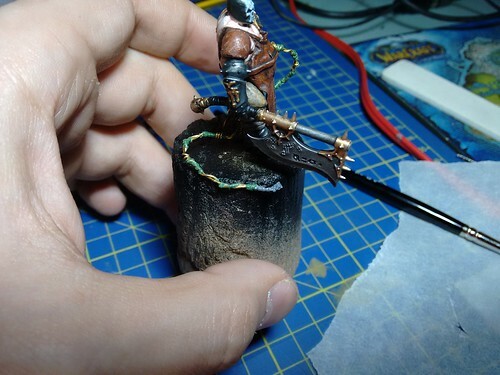 I started with a paper reference, roughtly adjusted to the height and the (generous) waistline of the miniature. Then I took a piece of Green Stuff, let it cure for 30 minutes and then cut the general shape based on the pencil design. 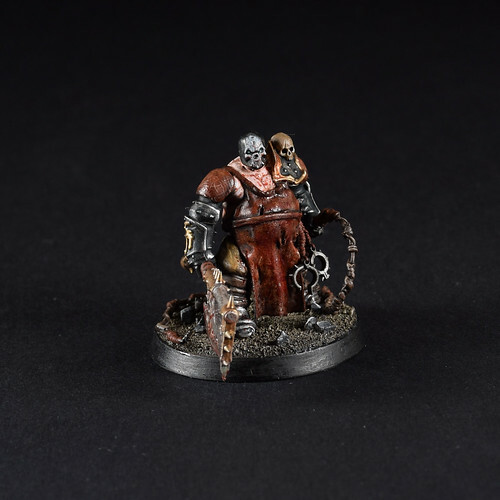 I let it cure for another half an hour and then I "dressed" the miniature. The GS was still decently elastic, so I took my time and stretched here and there, to add the folds and a couple of rips. Once completly hardened I added the shoulder and waist straps. The legs were still a bit oddly shaped, so I wrapped the ankles to simulate further leather straps and sculpted a rough armor on the right foot. Nothing complex. Just partially cured strips wrapped around existing pieces. For a little bit of extra character, I added a coarse patch of leather on the same trouser. 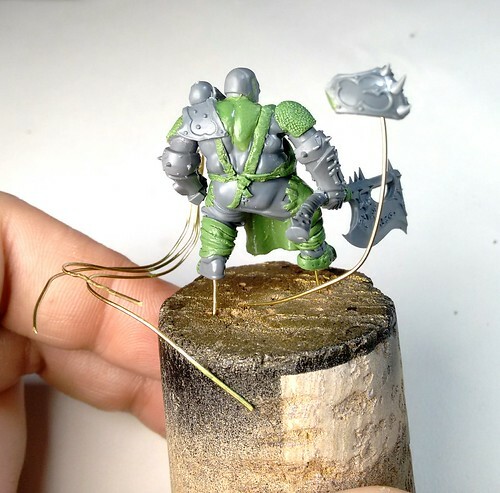 The bulky arms made the figure more intimidating, but they were completly cladded in armor. 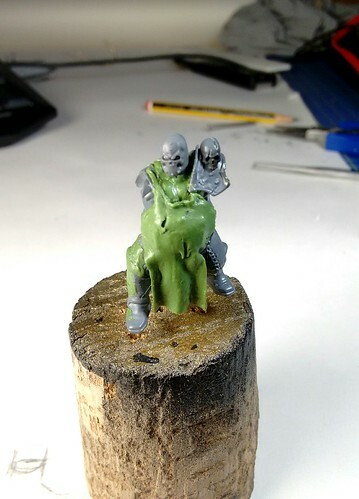 I connected them simulating a leather shoulderpad, to better fit with the general look. The result was achieved with a simple GS ball texturized with a scalpel and some straigh line. 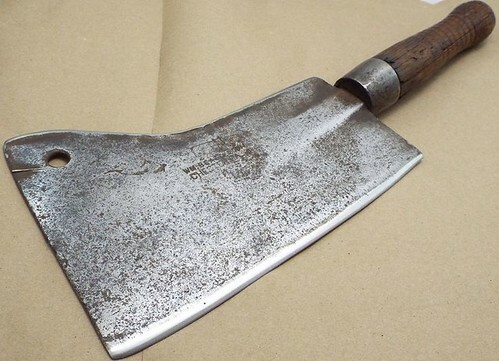 The big cleaver-shaped weapon was cannibalized from the Varanguard box. The junctions with the handle were covered simply resculpting the straps. 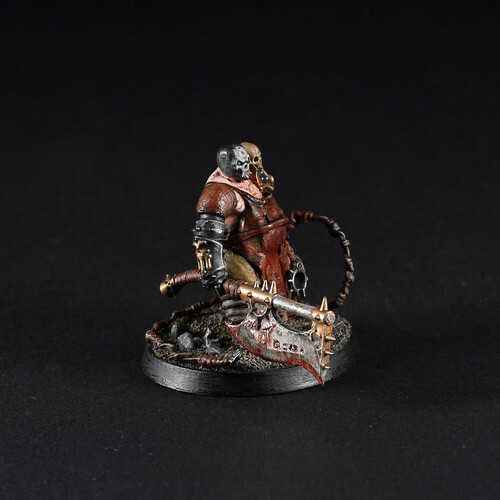 Given the ridiculous amount of leather element, I could take everything I learned with the stippling of the bloodwarriors and mix it on a larger scale. The pallid skintone helped breaking the monotony. The three-pieces going great this year! For the whip, I abandoned the "three tails" setup for a little thicker one. 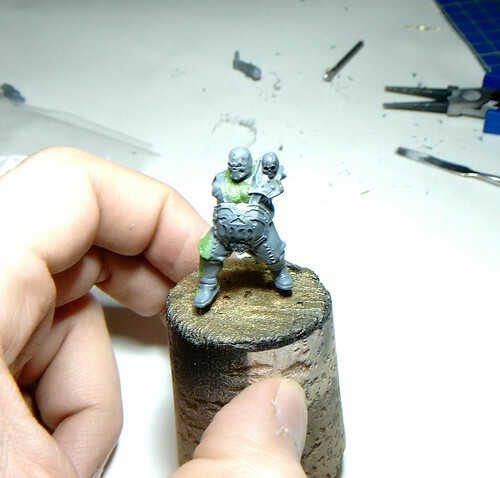 The pose is less dynamic than the original one, and the setup on the base was messy, making the whole miniature much more confusing. With a single "thread" I could wrap wires and GS making it more menacing and less intrusive on the visual. "Who's been a naughty Khorgorath?" 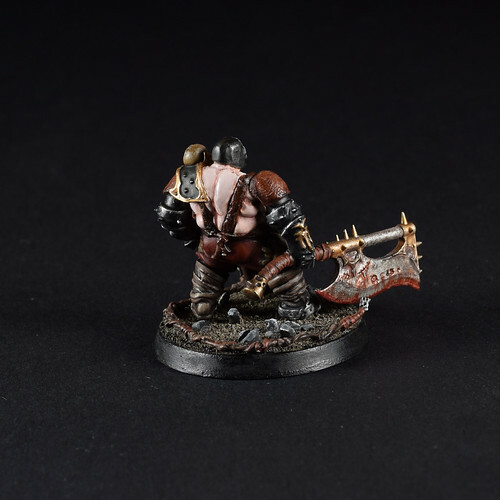 For the weapon, at first I tried some glowing runes, using the same tone of the eyes, but, as Jonathan correctly pointed out, it was "not very much Khorne". 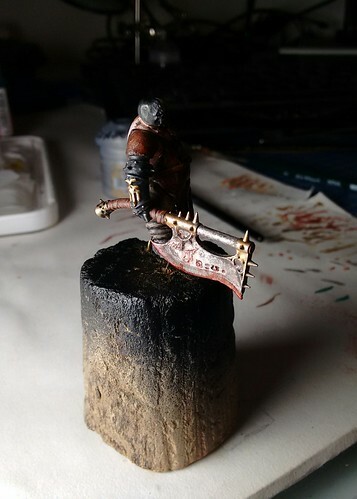 I started with a simple coat of silver, mistreating it with some tiny sponge chipping with a dark red brown tone, darkened here and there with some extra black. Some minor refinements were made with a tiny brush close to the junctions and the runes. Then I glazed in black/brown the opposite sides of the cutting edge, just a little, to better define the volumes of the blade. 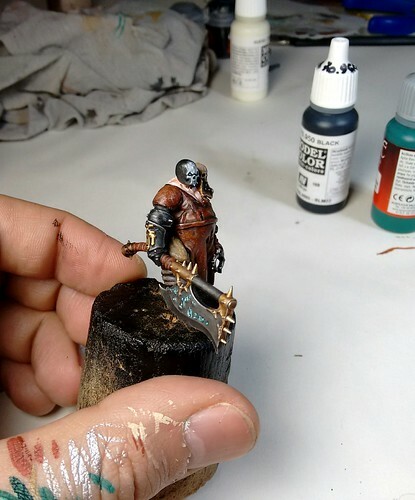 Once completely dried I switched on oils to add a subtle corrosion (just with brown tones) near the junction and some grime on the upper part of the blade, leaving the cutting edge almost untainted. Some blood, just on the lower side, dripping from the runes, looks definitely more Khorne. 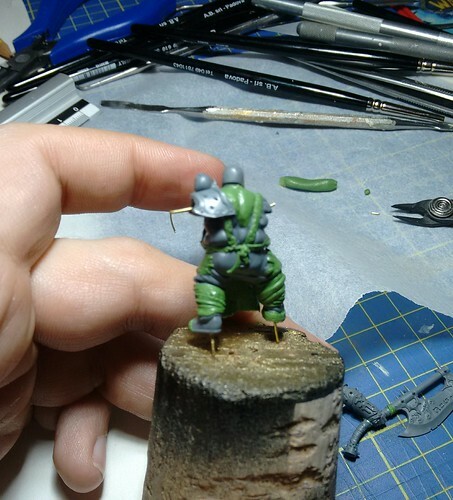 I had an extra armored shoulderpad for the right arm, but it was a bit distracting and the overall sculpt of the shoulder was decent enought to leave it uncovered.